Authoring for Interactive Digital Storytelling (IDS) requires reasoning in formal paradigms which has proven to be a difficult task. One of such paradigms is the narrative act, understood as “actions on actions”. We compiled a catalog of narrative acts and made it publicly available as an online interactive visualization tool. A preliminary evaluation deemed this ‘living’ tool as useful for inspiring authors of IDS systems. This research would not have been possible without the financial support from the Swiss National Science Foundation under grant No. 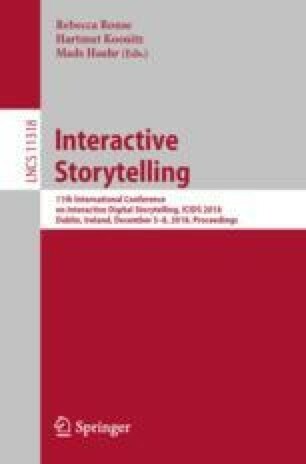 159605 (Fine-grained Evaluation of the Interactive Narrative Experience, N. Szilas, principal investigator).